If ‘The Prestige’ hamfistedly taught us anything, it’s that movies are big ol’ magic tricks. Lights shine on a screen, colors dance in front of our eyes, and we feel like we went to space…even though we’re still sitting in that movie theater in Glen Ellyn, Illinois that we walked into two hours ago. And the biggest trick of all might be how much baffling universe-building washes over us as we watch. Like in ‘Liar Liar’, why is Jim Carrey’s son a god? In the ‘Indiana Jones’ franchise, how is every god real? And according to Actually Oscar-Nominated Film ‘The Boss Baby’, is human history a nightmare psy ops forever-war? 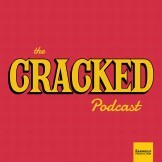 On this episode of The Cracked Podcast, Alex Schmidt is joined by Dan Hopper (Cracked, CollegeHumor), Dave Schilling (Bleacher Report, Grantland), Amy Nicholson (Variety, Earwolf’s The Canon), and a live UCB Sunset audience, for a deep dive into some of the biggest movies ever made. Find out why there are secretly terrifying characters and plotlines in everything from Star Wars to Wonder Woman to the finest film ever made (i.e. The Emoji Movie).